Day 1. Wednesday August 21st. Sector 1. Duxford to Southampton. This was going to be a busy day with lots of pressure on the crew. Jeff Boyling and Rod Brooking were well rested and rearing to go after a decent breakfast. At least the flight plan had been filed the previous day and now the weather was smiling on the crew with a clear blue sky to start with. Extra ground crew were on hand to assist Shaun remove the cockpit and wing covers prior to stowing them onboard along with the gust locks and Pitot cover. After many months of planning tension was mounting for Jeff but Rod was his calm self. Project Hawker 2013 Organiser and Co-Pilot Jeff Boyling, Captain Rod Brooking and Crew Chief Shaun Jarvis. 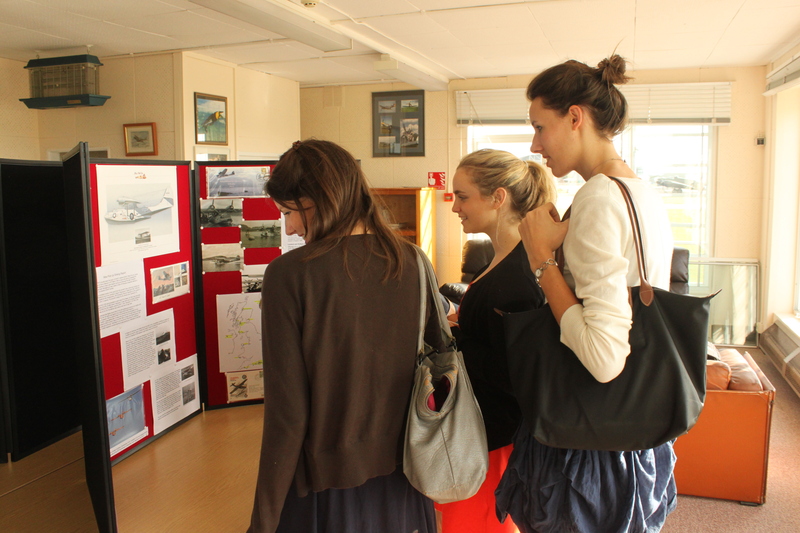 Jeff had organised a display board covering the events of 1913 as well as some history of G-PBYA, Miss Pick Up. His daughter Emma, who had flown in from Sydney, had checked the layout and approved it after some last minute improvements. Baz Stead, another Cat Pack member, took this and set it up in the briefing room below the Control Tower. Meanwhile, Jeff’s son Alex did a final check of the on board cameras. The three great grand daughters admiring the display board. 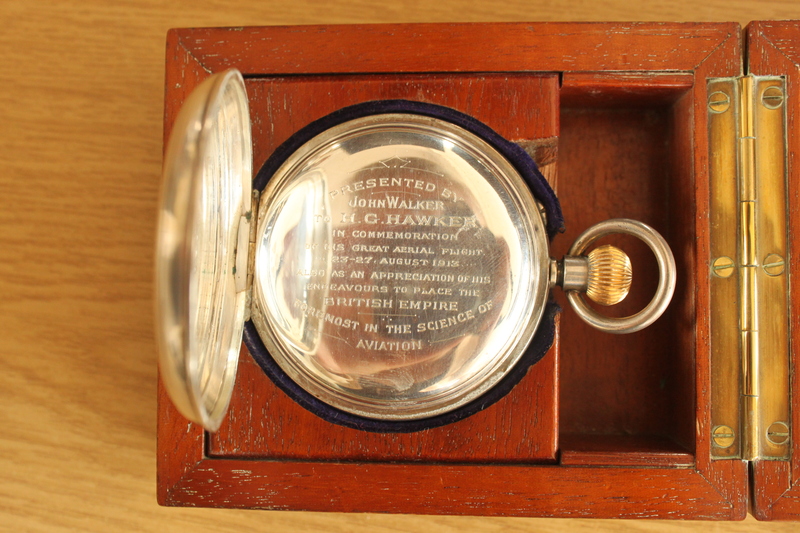 The time piece presented to Harry Hawker. More family and friends along with the important guests began to arrive at the Duxford nerve centre, the portakabin used by Plane Sailing Air Displays Ltd. Jeff was able to say a brief hello before he and Rod headed to the Control Tower and some final paperwork. 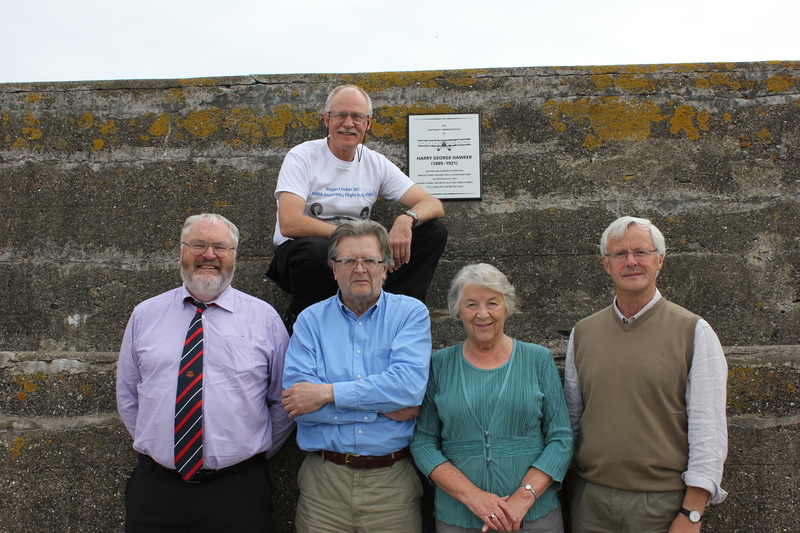 Jeff’s wife, Liz, was on hand and along with Baz Stead began shepherding the guests and visitors over to the Control Tower. Esther Blaine from the IWM was on hand with the press and photographers in their high viz jackets. 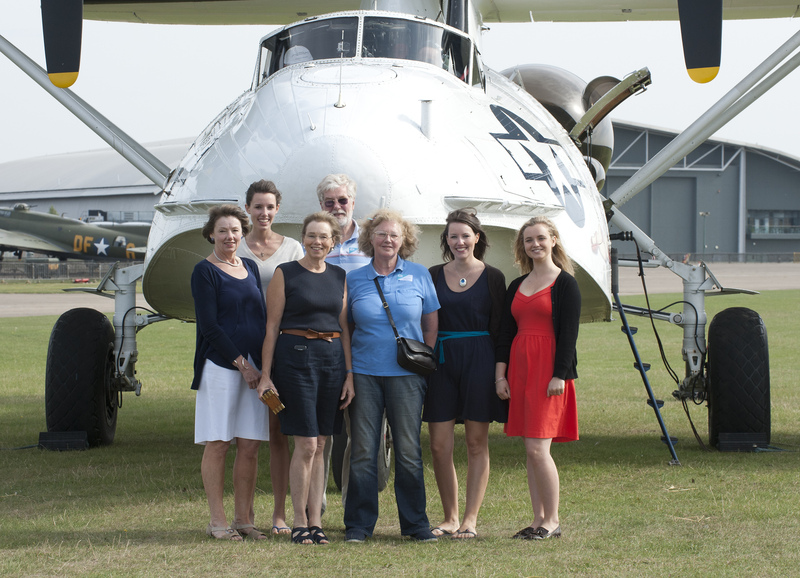 It was a great sight to see four of Harry Hawker’s six grandchildren there to see the Catalina off. There were also 3 great grand children plus a niece of Harry Hawker. He would have been impressed with all the attention! Jenny Edge (daughter of Harry’s youngest child, Mary) had brought along the Sopwith Waterplane Trophy presented to her grandfather by Shell. Jenny’s sister, Cathy Dimsdale, had her grandfather’s timepiece for the display. With the crew on board the Hawker relatives grab a photo opportunity. The airborne time was 1030 local so working back it was essential that the crew were on board by 1000. Rod had completed the walk round ensuring the gear locks were out plus signed the paperwork (tech log). Shaun had welcomed aboard the invited guests for their flight to Southampton. Departure from Duxford could have been a delayed affair due to the interest shown by the press and the surviving Hawker relatives. However, Rod sitting in the left hand seat drew upon his 35 years experience flying to ensure that was not to be. 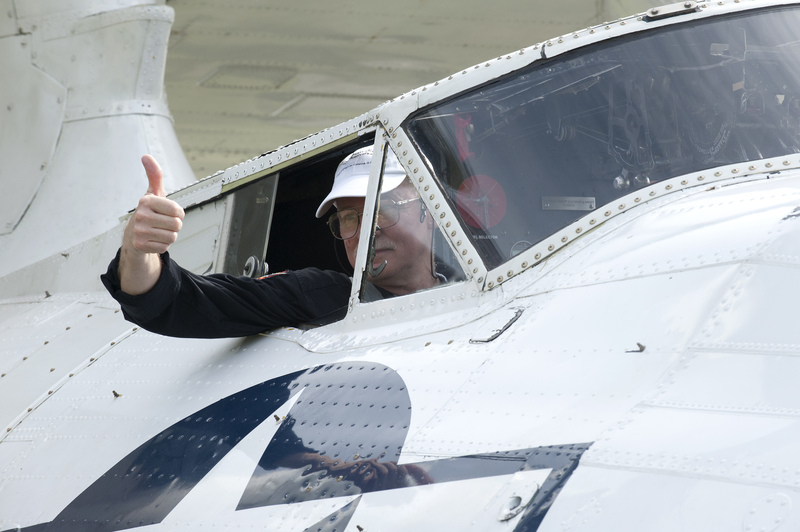 With checklists completed and engines running, it was a thumbs up from Jeff as the Catalina taxied out to Runway 24. Rod was pilot flying for this first sector and as he pushed the throttles forward the Pratt & Whitney’s smoothly responded with an impatient roar. The Catalina left on time and within the hour was on the ground at Southampton setting down invited guests but what a flight they had had. It is not every day that the opportunity to fly in a Catalina comes along. To have one that is over London and part of a historic commemoration are an added bonus. After takeoff and checklists complete, Rod and Jeff settled into the flight. 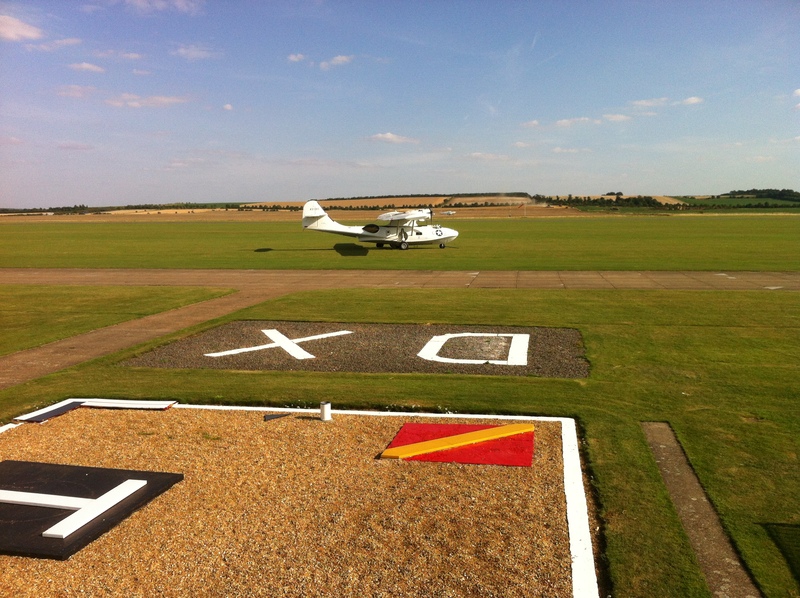 Jeff changed frequency from Duxford to Heathrow Special with the call sign “Catalina”. Cleared to enter the London TMA they flew south towards Tower Bridge not below 1400 feet. A gentle bank over the bridge, it was then a case of flying south towards Mitcham and Streatham before heading west, but now down to a 1000 feet. The next waypoint was Kingston, home of the Sopwith Aircraft Company in 1913. Flying parallel with commercial traffic on final approach to Runways 27 L and R at Heathrow it was a case of keeping just south of the railway line so as to maintain a 3 nautical mile horizontal separation. Those shopping in Kingston must have wondered what was happening but with a proud aviation heritage it should have come as no surprise! A left turn onto south and where was St Pauls Church at Hook? Jeff was pilot monitoring so he had responsibility for the radio plus navigation. The church steeple was on the nose and with a few seconds to run floats were lowered as a mark of respect for the final resting place of the man who gave his name to aviation, the great Australian pilot Harry Hawker. He had learnt to fly at Brooklands and that was the next waypoint. What a sight to behold as the Catalina banked around to the left with Concorde on the ground underneath with a great crowd of onlookers waving. Departing the London TMA, Heathrow Special wished the crew well and passed them onto Farnborough Radar. Soon the Catalina was joined by a chase aircraft for some air to air photography. Jon Butts flew this with Karl Drage behind the camera. Another frequency change this time to Southampton Approach and soon both aircraft were on final approach. 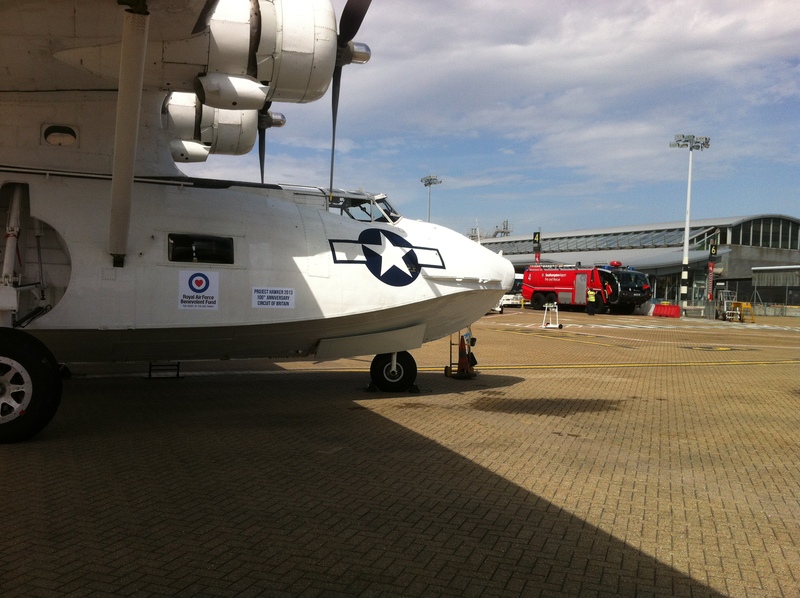 Mike Glen from Southampton Airport Airside Ops was on hand to marshal the Catalina onto Stand 5. The passengers waiting in the terminal must have wondered who was scheduled to fly on such an old plane. Alas, with four air displays planned on the next sector it was to be only Rod, Jeff and Shaun i.e. a minimum crew as per CAA rules. The Catalina G-PBYA Miss Pick Up at Southampton Airport. Jeff Boyling had already been to Duxford on the Monday for a photo shoot with the Daily Mail photographer and an interview with the London Bureau Chief of an Australian newspaper. 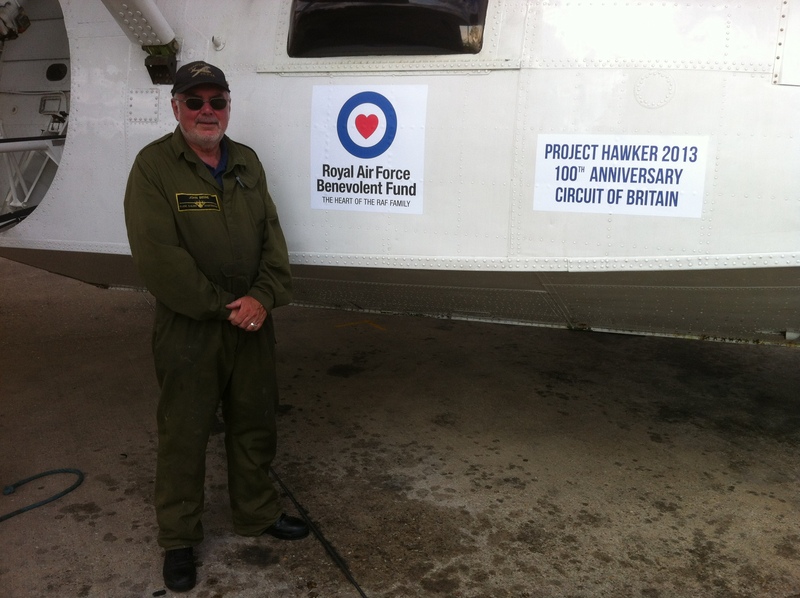 Prior to those two events, John Beere, a member of the Cat Pack, had applied the decals for Project Hawker 2013 as well as the RAFBF to each side of the Catalina G-PBYA and they looked great. The oil supplied by Shell had also been loaded by Garry Short, the Chief Engineer, as part of the preparation of this historic 70 year old aircraft for this 100th Anniversary Commemorative Flight of the 1913 attempt on the Circuit of Britain by Harry Hawker and Harry Kauper in a Sopwith Waterplane. Tuesday was a lovely day. Rod Brooking drove in to London and left his car at Jeff’s house. The two then drove to Duxford late morning to start the final preparation. Jeff and Rod reviewed flight plans for the coming days. The weather forecast was looking good for the Wednesday so the Catalina should at least get away. Shaun Jarvis, the Crew Chief for the first couple of sectors, arrived in the afternoon and supervised the final loading of the aircraft. G-PBYA was almost ready. Late afternoon she was towed onto the grass opposite the Duxford Control Tower ready for her important mission. Fuel and oil tanks were dipped and topped up by Shaun. All that was needed now was a comfortable night’s sleep after dinner. The first day of Project Hawker 2013 will follow tomorrow and the rest of the flight over the coming week. I have just been on ABC Radio with Macca. The programme goes out Australia wide and hopefully it will generate more interest in Harry Hawker especially with the plans to celebrate the 100th anniversary of the Sopwith Tabloid going to Australia in 1914. There was a crew change over in Oban so a great chance to get everyone together. 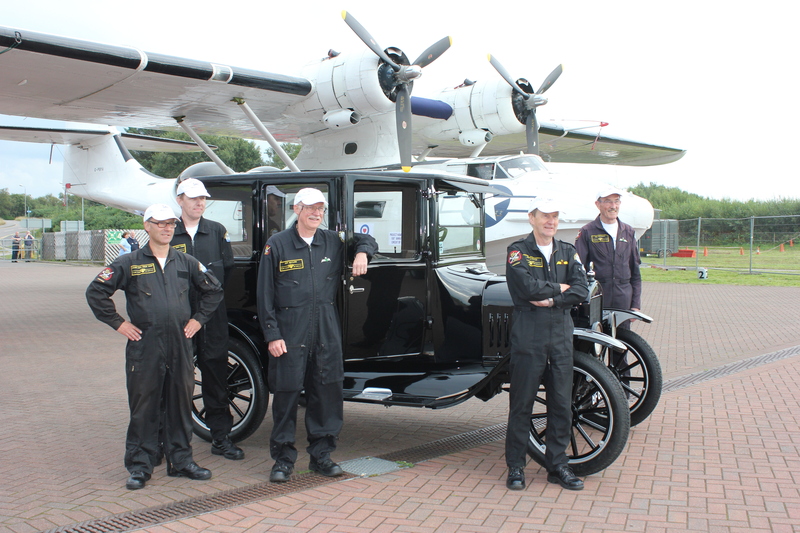 From left to right, Crew Chiefs David Legg and Shaun Jarvis, Project Hawker Leader and Co-Pilot Jeff Boyling and Captains John Warman and Rod Brooking with the star member G-PBYA in the background. Well done to all from the organiser! A piece of the jigsaw is missing so I am off to Loughshinny on Wednesday. That will allow me to see the plaque unveiled by the Australian Ambassador plus meet the locals. No doubt I will see photos but will I find any aircraft remains is the big question? 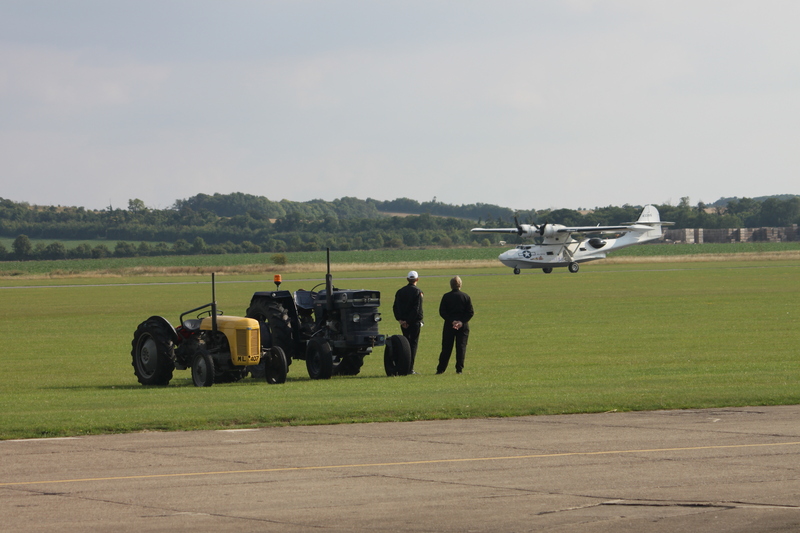 The IWM Duxford based Catalina G-PBYA operated by Plane Sailing Air Displays Ltd returned safely to Duxford yesterday afternoon. 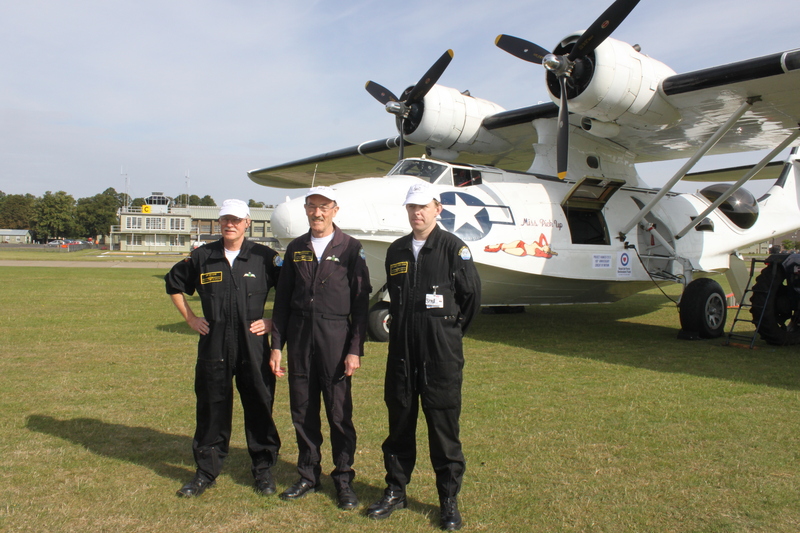 The Catalina had spent 5 days on a Circuit of Britain to commemorate 100 years since the attempt by Harry Hawker and Harry Kauper in a Sopwith Waterplane. Although the flight has been successfully completed there is still a lot to do. The website will be updated with information and photos of the flight over the coming weeks. There are hundreds of emails, posts and comments to be responded to and that is on the “to do” list. For now, a big thank you to all who have been involved. You have contributed to a truly memorable experience!